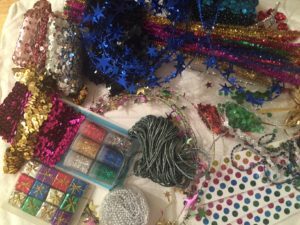 Assorted examples of glitter & sparkly stuff passed along. I like glitter as much as the next person. I also like sparkly, colorful objects. I especially like making stuff, including stuff made out of glittery, sparkling materials. However, at some point there needs to be some limit to the amount of crafting and sewing supplies one attempts to keep at hand. Especially, as one’s crafting/sewing foci evolve. Recently, we replaced the last of the old windows in the house. These final two windows both happen to live in rooms belonging to me: my office and my sewing/craft room. A lot of things needed to be moved and /or dismantled in order to accommodate the installers. Once the windows were replaced and the window sills tiled (see previous Window Sill Tiling post), I was determined not to put anything back into the sewing/craft space until I had a chance to sort through it. After all, I have been sewing and crafting and costuming for, um, a while now. In that time, I have collected a great deal of stuff, much of which I really have no need for. I also don’t really have room for all of it. 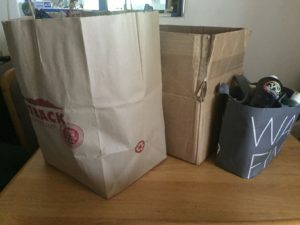 Not to mention that having excess stuff I don’t use makes it difficult to organize (and often find) the stuff I do want or need for a given project. Yes, I am a border-line hoarder, especially when it comes to sewing and craft materials. Craft and sewing stores like Michaels and Jo-Ann love me! But (wonders never cease) I was actually ready to let go of some stuff. Great. I had a plan. And author appearances, and deadlines, and volunteer work. Time passed. Meanwhile, my library was filled with piles of stuff that glared at me every time I went in there. Finally, things calmed down enough for me to take a stab at turning my craft mountain into a molehill (to usurp a cliché). It took most of a day, but I managed to reduce my stockpile by two bags and a good sized box of stuff. Crafting supplies & paint ready for re-homing. 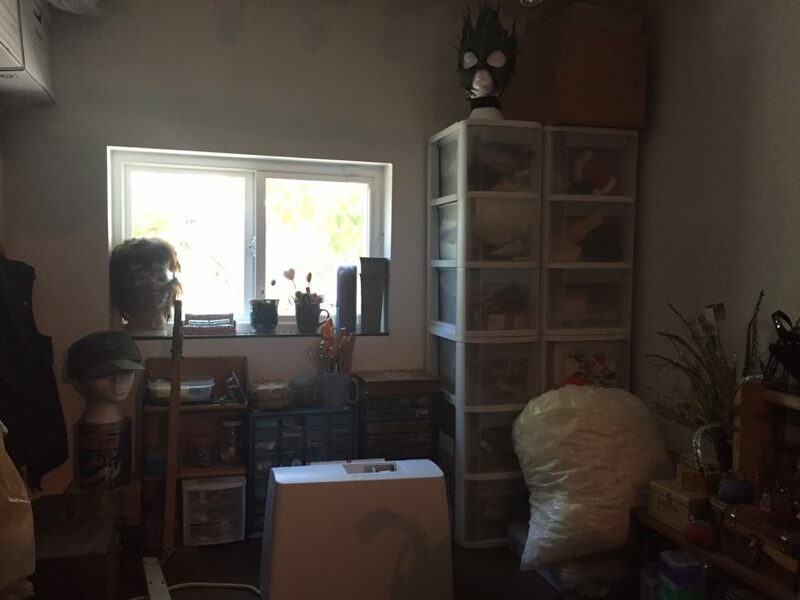 Oh, did I happen to mention that everything I moved for the window install was just one third of my sewing and craft area/stuff? Yup. I need to work on the rest of the room next. 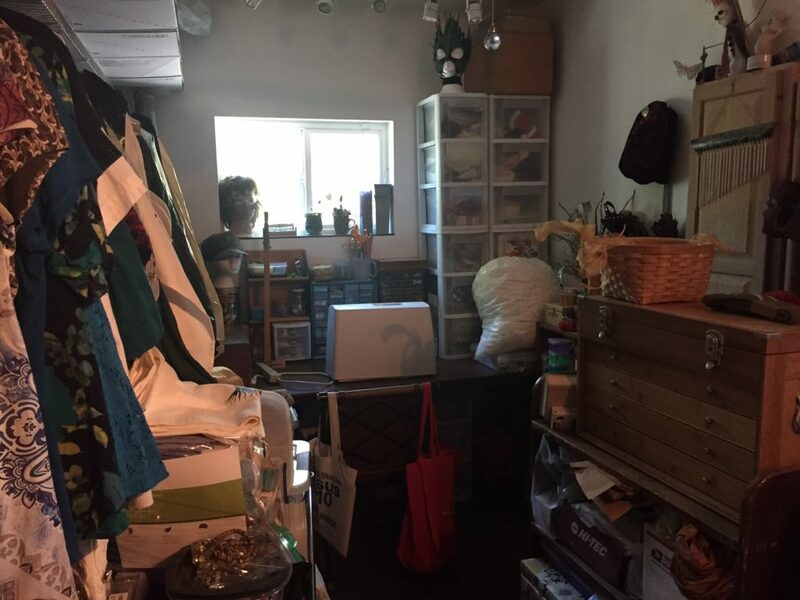 Crafting/Sewing Room: Still some work to do.